I don’t generally look for a McDonald’s restaurant when traveling. Without kids in tow, fast food places don’t hold much appeal. But when you’re lost in a foreign country, the Golden Arches can be a very welcome sight. 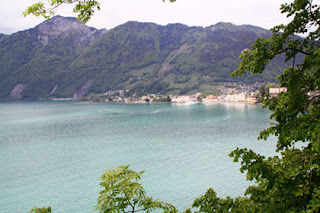 After arriving in Zurich on our recent trip to Switzerland, we immediately got our rental car and began driving to the Jungfrau region, with Lauterbrunnen as our destination. But somewhere south of Lucerne we took a wrong turn on the highway, and our Google map, printed out in the States, just added to the confusion with place names and road numbers we couldn’t seem to decipher. Although it soon became apparent that we were not on the intended road, we really didn’t know where we were or how to get back on track. 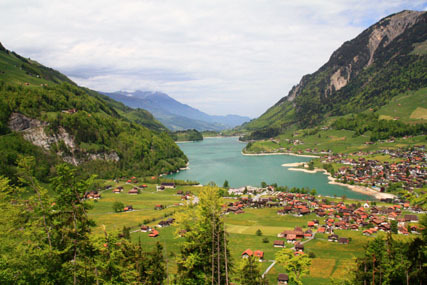 Finally, Larry exited the highway and pulled into a small Swiss town—name still unknown. Tired after an overnight flight and hungry since it was almost 2:00 p.m, we quickly spotted the McDonald’s and decided it was a good place to stop. We ordered burgers by pointing at pictures (no English speakers in small towns) and eagerly devoured our food. Then Larry took our Swiss map to the young man sweeping the floor and motioned for him to point to where we were. It was good enough for us to find our bearings and get back on the right highway. 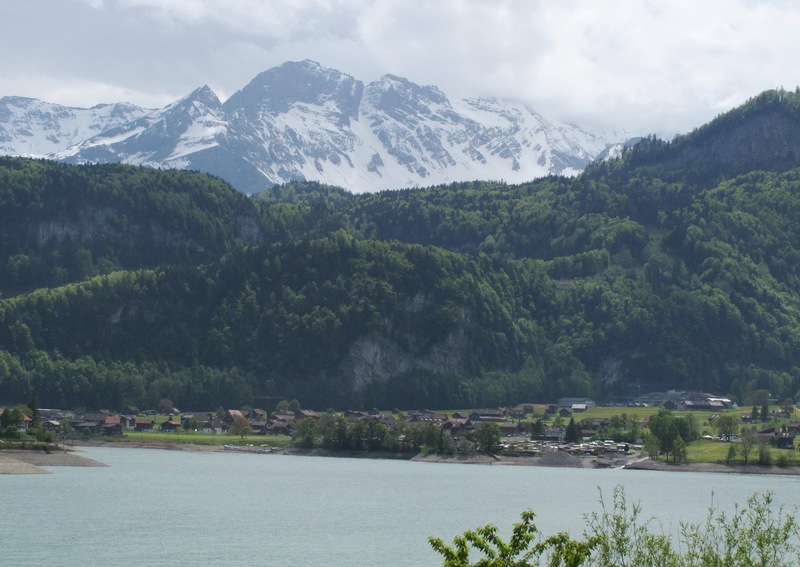 Except for the delay, it was a lovely diversion, a side trip into beautiful landscapes for which Switzerland is known—turquoise lakes with snow-capped mountains in the background. Occasionally a stray boat or ferry glided across the water, and wind surfers clung fiercely to their sails while skimming icy water. After six days in the Alps region, we headed to Wadenswil, a small town about 10 miles south of Zurich where my son’s family lives. Again McDonald’s came to the rescue. Driving by the seat of our pants, we knew we were getting close. Again, we had passed the usual lunch time and needed a break as well as time to look over our maps to determine where we needed to go. And there were the Golden Arches. As we pulled into the McD’s (which we later found out is the only one in a 50 mile radius), I suddenly realized that we were, in fact, already in Wadenswil. What relief to find something familiar when everything else is strange. I still don’t search out McDonald’s in the States, but I won’t ever disparage the ubiquitous eatery when traveling in foreign countries. Photos by Larry and Beverly Burmeier; also free image of McDonald's logo.